Disposable biotech sensors won’t let you diagnose your own diseases quite yet, but we’ve taken the first step — a research team spanning three universities has successfully prototyped a lab-on-a-chip. 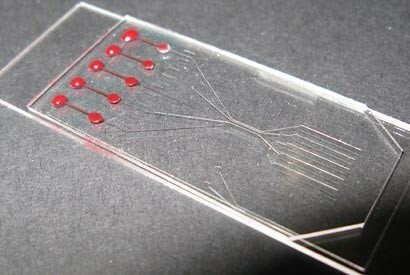 Called the Self-powered Integrated Microfluidic Blood Analysis System (or SIMBAS for short, thankfully), the device takes a single drop of blood and separates the cells from the plasma. There’s no electricity, mechanics or chemical reactions needed here, just the work of gravity to pull the fluid through the tiny trenches and grooves, and it can take as little as ten minutes to produce a useful result. It’s just the first of a projected series of devices to make malady detection fast, affordable and portable. Diagram after the break! Massachusetts General Hospital (MGH) researchers are investigating a new approach to gene therapy for brain tumors – delivering a cancer-fighting gene to normal brain tissue around the tumor to keep it from spreading.